The picture may not look too appetizing, but the dish was very satisfying. 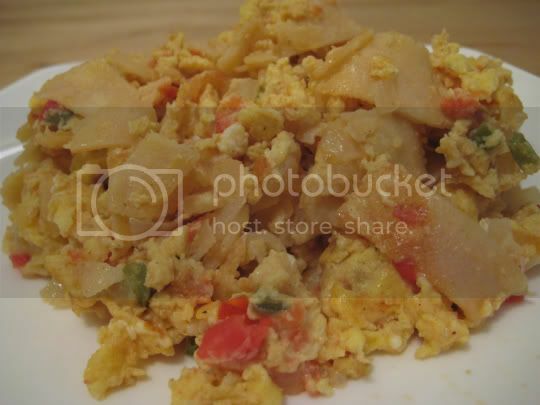 Take scrambled eggs, mix them with cheese, tomatoes, onions, jalapenos, and corn tortillas...and you've got migas. Great for breakfast, or maybe even lunch, this popular Tex-Mex favorite was hearty and flavorful. This would be a good breakfast burrito filling, maybe with some chopped veggie bacon or sausage added in. And mmmm, a margarita to wash it all down. Make again? Yes, and maybe halve the recipe next time. Leftover eggs are not tasty. "Migas," Low-Fat Soul, Jonell Nash. Ballantine Publishing Group, New York, 1996. MMMMMM, it looks good in the picture. It sounds even better. I shall try.